One of the things I do A LOT of these days is sketch. Mostly, I am working quickly to try to capture the essence of what I am looking at. Working quickly forces me to get the overall feeling of the picture, without getting caught on the detail. 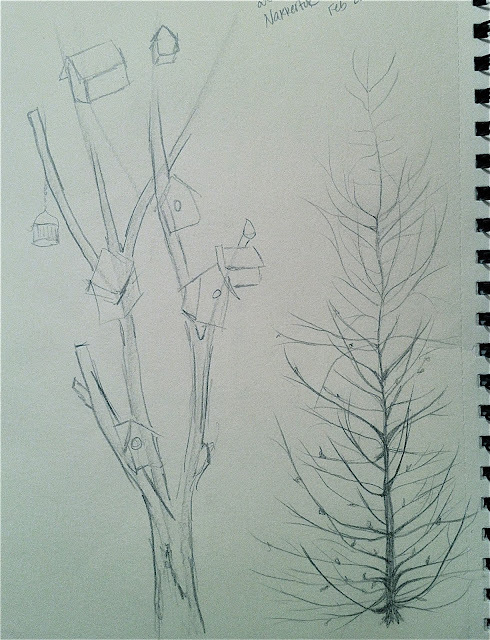 Fast sketches also get the right side of my brain kicked into gear, which as you know is the creative side. 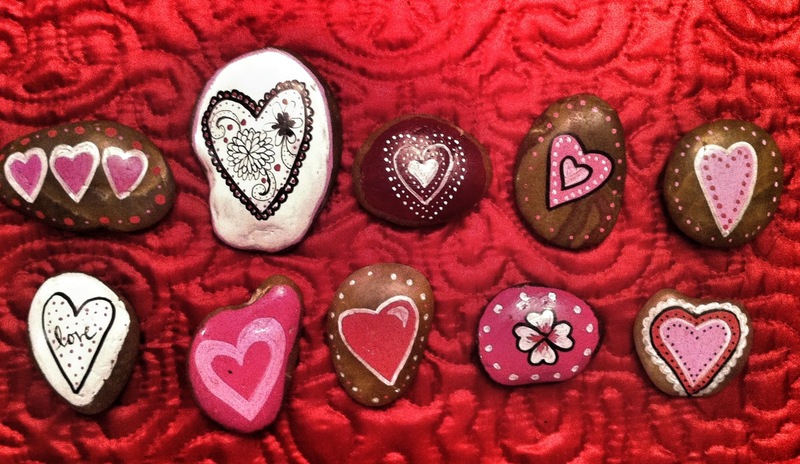 I am amazed at the difference in my work when I work right-brained, not left-brained. (I know, I know ... it's only one brain...). I am working hard at growing and improving my skills as they had laid dormant for many years (until I began creating again.) As part of my development, I am studying under a local artist. 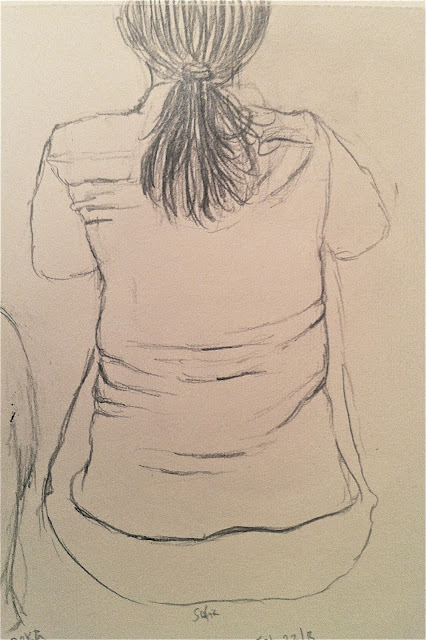 One of the exercises he has me do is one minute sketches. A few of those are included in the set below. 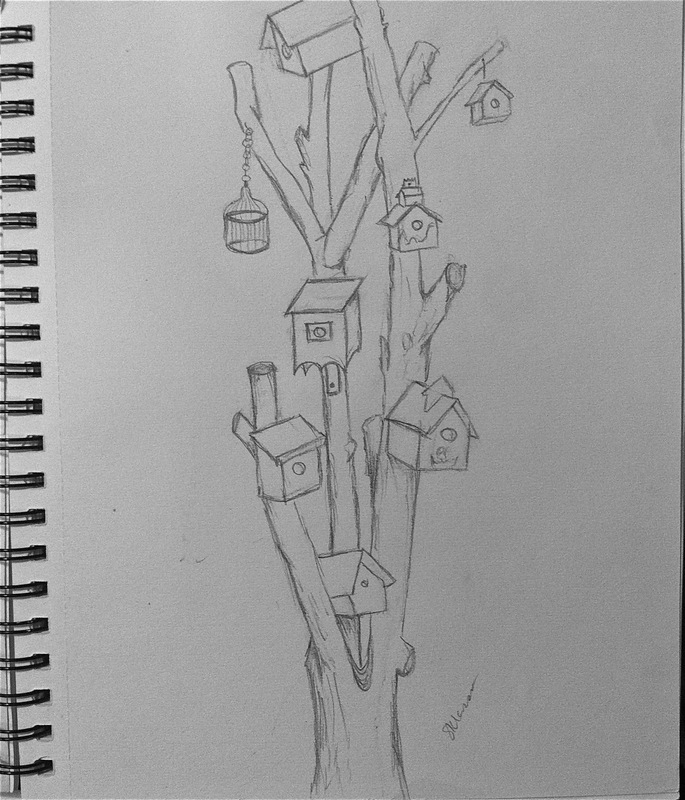 I loved the bird house tree so much, that I took a little bit of time sketched it in some more detail. I carry a couple of sketch book with me at all times (pretty much no exceptions) so that at any moment, I can start to draw. I keep a Strathmore 5.5" x 8.5 inch in my "art bag" which I bring with me pretty much everywhere I go. My art bag also holds a small pencil case, and my travel watercolour paints, as well as a few brushes and tiny water pot. I put other supplies in my bag as well, depending on my mood & needs, but those are my "must haves." And, just in case, I don't have my art bag with me, I keep a small sketchbook and black Faber-Castell Pitt permanent marker in my purse at all times. 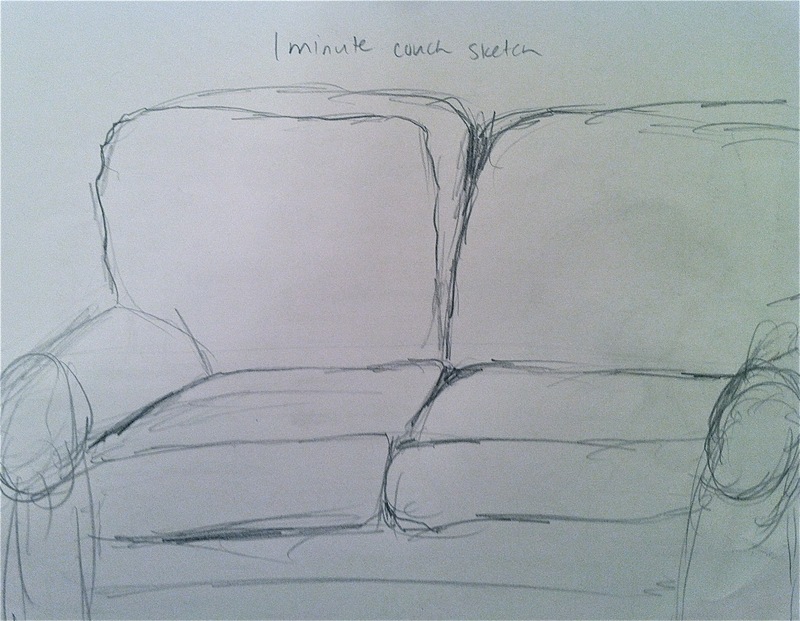 Sketch quickly! Don't worry about details, just capture the overall feel of what you are sketching. Fast sketching shuts down the detail-needing left side of your brain and allow your right side to kick in. Use all your senses when you sketch - touch the object if you can, breath deeply, listen to the sounds around you. You heightened senses will all positively affect your ability to draw. 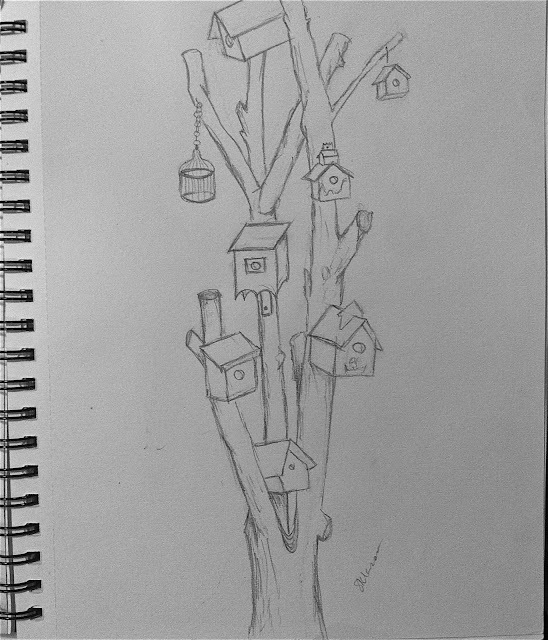 I'd love to hear from you if this inspires you to begin sketching! 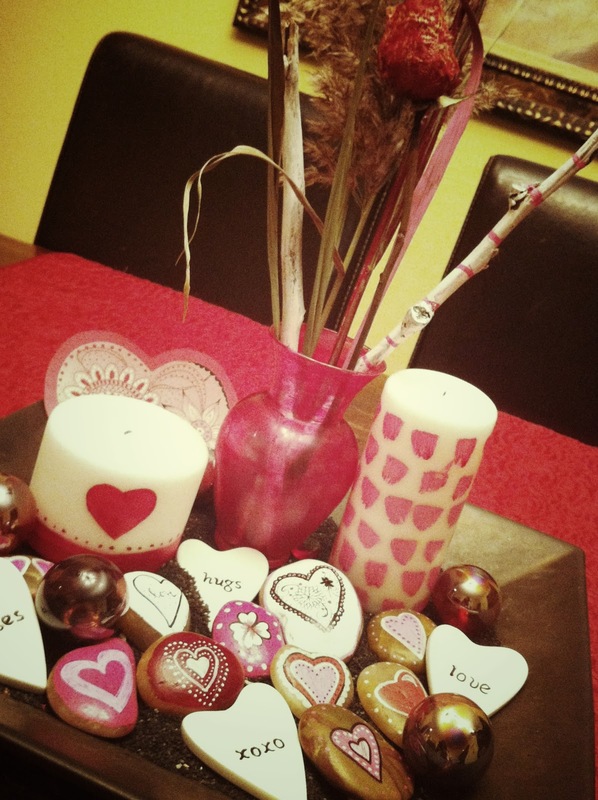 More and more I am loving home-made decorations. In our home, every holiday and celebration is a chance to put up decorations and I love to personalize & create some of ours. The vase was initially clear and had been sitting in my studio for months as I had planned on using it for a different project but didn't. I painted it with crimson acrylic paint and used my fingers, giving it a bit of a streaked look. I also painted two white candles that I had in my bathroom. I have the beginnings of a nature collection forming in my studio and all parts of it are available for painting or altering. 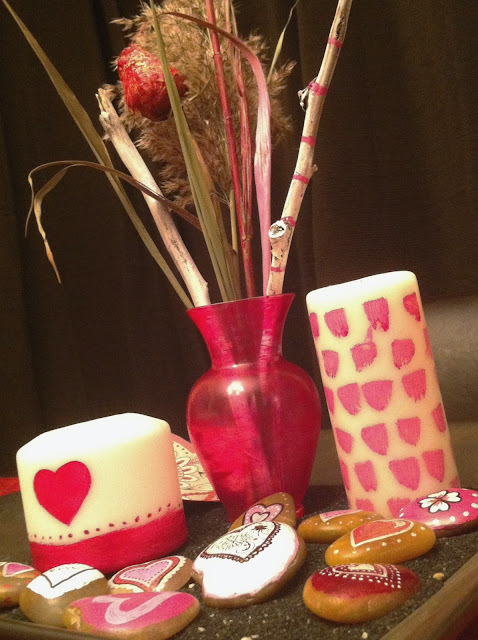 I painted the dried rose crimson red, I painted the sticks white and pink and I even painted the reeds. I had a lot of fun decorating the rocks, using markers as well as acrylic paint, and then coating them with a sealant. 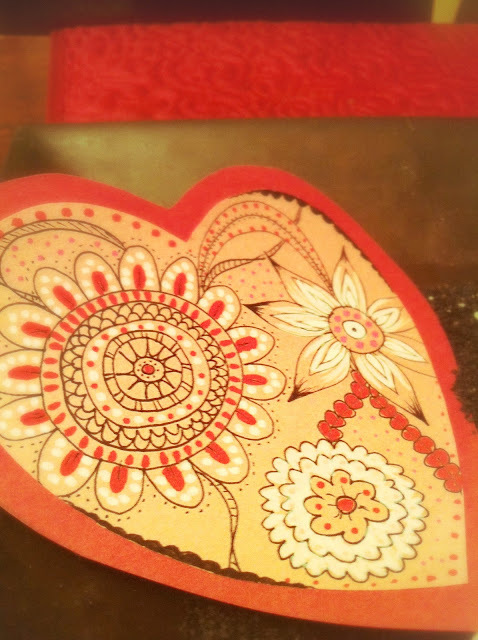 And tucked in behind is a heart, made on pink & red construction paper that I doodled on. 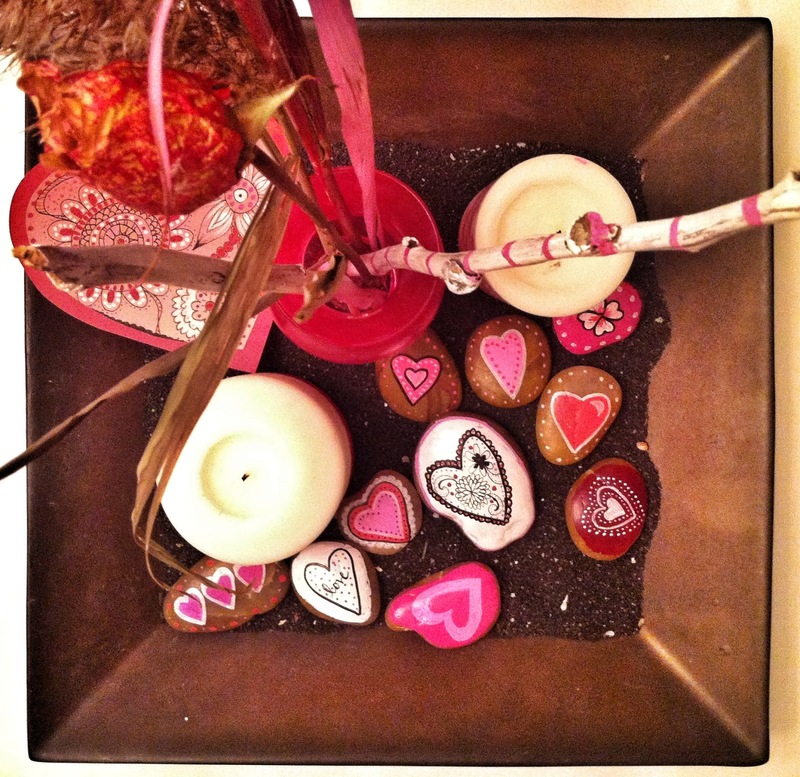 Lastly, I added four store bought white hearts that I've had for years, as well as some glass balls. 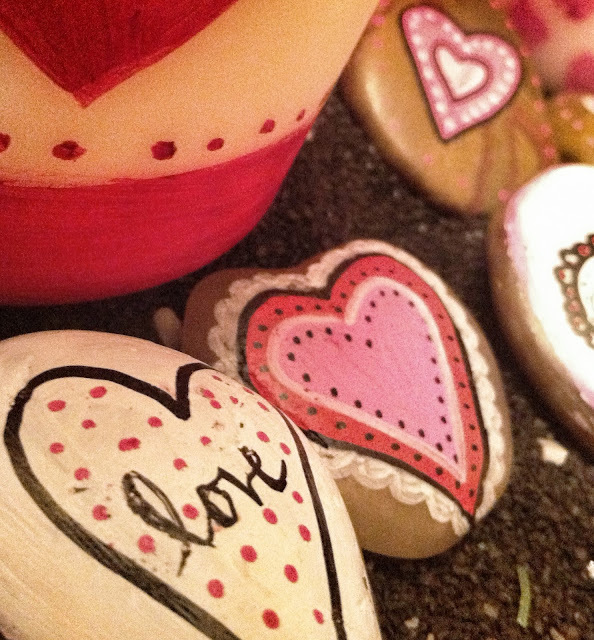 Look around your home and see what you can use to personalize your decorations. A little bit of paint can go a long way!